Wanakafest – Wanaka’s celebration of the community and spring takes place from Wednesday 20th October to Sunday 24th October. The Labour Weekend will be a barrel of fun and full of entertaining communtity events as Wanaka locals celebrate the start of the summer season. Passion For Fashion Show – 7 to 9.30pm at The Lake Wanaka Centre. The highlight for me is the Piggies for Fashion which will be on display. These are the famous piggies from the BNZ bank ads that have been given a serious makeover by talented locals. Moviefest – 7 to 9pm at Lonestar. This is a competition showcasing local filmmakers short films of approx 2.5 to 3 minutes each. A delicious celebration of Wanaka Wines and foods with all the wines grown in Wanaka, complimented by food from talented local chefs. Come and join the locals as we celebrate living in the best place in New Zealand! Challenge Wanaka must be the worlds most scenic iron distance triathlon covering a distance of 226km. Described by athletes as one of the best in the international circuit, it is set against the magnificent background of Lake Wanaka and the Mt Aspiring National Park. The mental and physical challenges will push athletes to their limits but the support of the locals is superb with the resulting atmosphere helping the most exhusted competitor over the finish line. The weather in Lake Wanaka in January is stunning, and an average day is 26-28 degrees celcius with clear blue skies and very little wind. It is however an alpine environment so athletes must be prepared for all eventualities. Registration for the main event starts at 9am on Thursday 14th January 2010, with the main race starting at 7am on Saturday 16th January. Warbirds Over Wanaka International Airshow 2010 will be a must-see airshow. For three days over Easter, Lake Wanaka will become centre-stage for an extravaganza of aerial action that will delight both aviation buffs, families and those wanting a superb days entertainment. 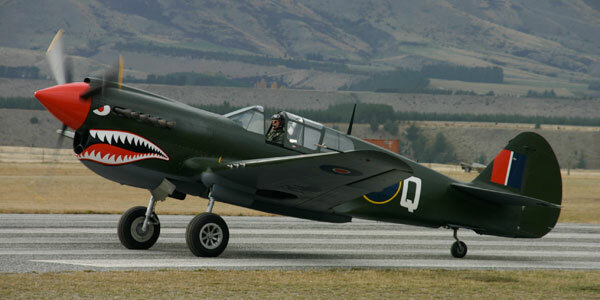 At Warbirds Over Wanaka you are so close to the continuous action you feel like you are in the pilot’s seat.